Simon & Schuster Books for Young Readers, 9781442406735, 32pp. When Mama Chick kisses her kids goodnight, she expects them to stay in bed, but those chicks...run...wild! They jump around and do cartwheels, until Mama comes in and says "You're all in trouble. But when she turns out the lights...they start a pillow fight! Finally, Mama gets them settled, but she's not ready for bed either! Sudipta Bardhan's playful ryhme and not-quite-ready for bedtime attitude and Ward Jenkins' exuberant artwork will delight both parents and kids! Sudipta Bardhan-Quallen has written many picture books including Chicks Run Wild, illustrated by Ward Jenkins; Tightrope Poppy, The High-Wire Pig, illustrated by Sarah Dillard; Duck, Duck, Moose!, illustrated by Noah Z. Jones; and Rutabaga Boo!, illustrated by Bonnie Adamson. She lives in New Jersey with her three children. Learn more about Sudipta and her books at Sudipta.com. 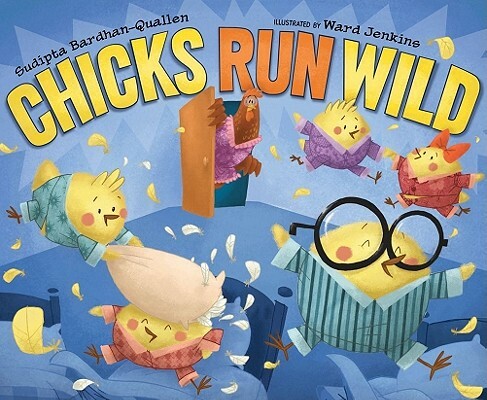 Jenkins's artwork has enthusiasm to spare, and he has great fun with the "if you can't beat 'em, join 'em" ending that has the tired chicks begging Mama to go to sleep and has Mama running wild herself: by painting her toenails and watching a TV romance. The chicks are fluffy and appealing; Mama appears progressively more stern, as she looms larger in the doorway each time she must come back. Young listeners will quickly learn and want to repeat the refrain, set off in large type and curving above chicks jumping on the bed, somersaulting through the air, and whacking each other with pillows: “Those chicks run wild!” Grown-ups will enjoy the final scene, where “Mama runs wild,”painting her toenails red, having a cup of tea, and watching Gone with the Wing.